Once the wrist and hand is either able to maintain alignment or is supported in alignment, the next step is to increase the child’s awareness of the hand. 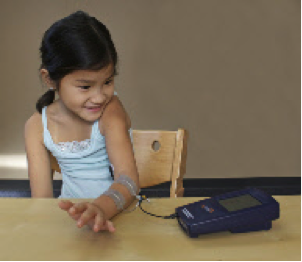 This girl is experiencing EMG Triggered Stimulation or ETS to activate wrist and finger extensors. This unit combines a traditional neuromuscular stimulator (NMES) with a surface EMG unit. The surface EMG unit senses and displays muscular activity. Several different types of graphs, as well as an auditory feedback, can display these signals. EMG biofeedback is widely used in adults for stress reduction, occupational rehabilitation and by athletes wanting to improve their performance by increasing awareness and specific muscle activation. When I ran the Magee Clinic in Toronto, an EMG biofeedback session was part of every new patient evaluation. I found it to be a very useful “aha” moment as children and adults quickly learned to find a muscle and increase its activation. For people who lived near the clinic, we often had them go through a series of EMG biofeedback sessions and in the older teen and adult, there were very good responses with improved function that persisted after the EMG session. Not so much in the younger child. The EMG Triggered Stimulation (ETS) technique is widely used for stroke rehabilitation in the Europe. It has been available and used for over 20 years and there is an extensive literature documenting some value, even in chronic stroke patients. (http://stroke.ahajournals.org/content/31/6/1360.full) In spite of this, it is rarely used in North America and even less in children, teenagers and even adults with an early acquired brain or nerve injury. It is quite understandable that it is not widely practiced in the very young child, but that does not mean that it should not be added to the toolbox of therapists dealing with older children and teenagers. It is a constant frustration for me to realize that because it may be difficult to use a technique or technology in a small child, it is virtually never used in a teenager who has completely different brain than the small child. The maturation of the brain is intimately related to puberty. It would be lovely if they all went through it at the same time, but the truth is very different. Girls go through puberty on average 2 to 4 years earlier than boys and that means that their brain matures faster. Further, the early maturing boy’s brain is very different from the brain of a late maturing boy who may only start to grow and mature at 16 to 18 years. Unfortunately, our school system is totally driven by the ages, not the stages of brain development. For the purposes of hand rehabilitation, the teenager has a completely different brain and we should start again at the beginning with alignment, correcting all the distortions and weaknesses that have developed over the years. However, even with a more mature brain, the teenager is unlikely to be motivated to work on their non-dominant hand unless you create a few “aha” moments to demonstrate that better control is possible. Once the older child or teenager has awareness that the wrist and hand can work, they are much more likely to be interested in doing the work to improve function. A few years ago, I was teaching a workshop at the Cleveland Clinic and had the chance to try out an ETS unit on a teenage girl with very little use of her affected limb. She was initially shy and quite hesitant to try it, but as soon as she could actually activate her wrist extensors, she was excited and eager to do more. It was interesting that after one session of about 20 repetitions, she was able to activate her wrist extensors on her own. I have had similar responses with teens with BPI. The neuroscience reason for this is that the brain operates on a “use it or lose it” basis. If the hand is progressively less “used” as the child grows into their teen years, the brain map for that hand will grow smaller. Fortunately, using techniques to improve awareness and activation, the brain map can be enlarged and the teen can learn to differentiate the various movements of the hand. The biggest stumbling block to overcome in the rehabilitation of the older person’s hand is building the motivation to try. From their perspective, they have done years of therapy and have not achieved the result they wanted. The sad, but true fact is that for the older child, teenager and adult with an early-acquired brain or nerve injury, their movement patterns have become habitual. Coaches and athletes know that habits are not broken, but they can be replaced with new ones. Making a new habit is hard work requiring focused, purposeful practice. ETS is an excellent technique that demonstrates a more normal movement pattern in a novel way. Repeated use activates new pathways in the brain and strengthens the muscle. If the alignment issues are addressed, most people can rapidly learn to activate the muscles on their own. Then they have to practice, practice, practice to integrate it into a new habitual movement pattern. Next week I will discuss a few more advanced techniques for arm and hand rehabilitation. As ever, your comments and questions are welcome. Are you suggesting above that this kind of electrical stimulation should not be used as a therapy tool for children, even as a way to impede those ‘bad habits’ from forming?? My son River (who i’ve contacted you about in the past) is four and a half, and I definitely feel strongly that his potential to use his muscles and move his body is currently far from being achieved. Is there a particular age or other threshold you feel should be met in order to use this approach? Hi Anna, Thanks for the question. Sorry if I was not clear. I think EMG Triggered Stimulation(ETS) and classic Neuromuscular Stimulation (NMES) can have a role.Start with alignment and support, then both types of stimulation can help with activation and awareness. Most children of 3-4 years can use them effectively.The ETS technique is more comfortable and I think a more “neuroplastic” intervention. With ETS the child’s brain turns on the stimulation. In NMES it is turned on either with a trigger switch or a preset program. Most of the neuroplasticity research indicates that active involvement in the task works better. Hope this helps.